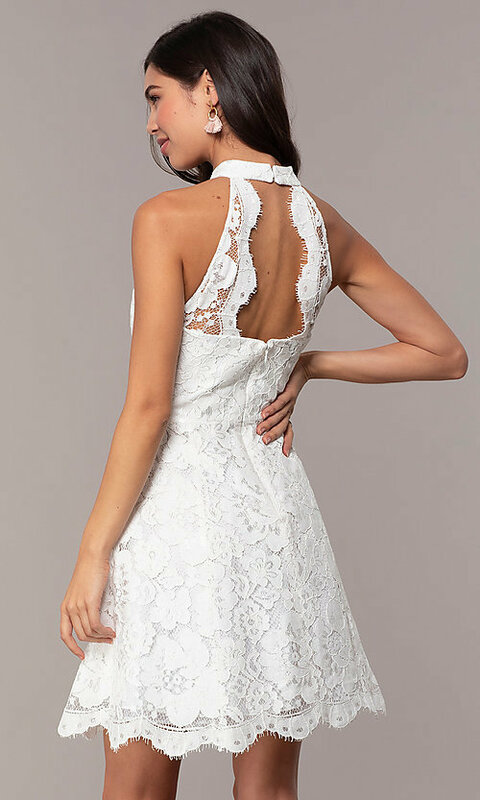 Look lovely in lace when you wear this white grad party dress to commencement 2019, a rehearsal dinner, or another semi-formal event. The high-neck bodice on this little white graduation dress features a sheer lace panel that reveals a sweetheart lining. The collar wraps around and connects at the nape of the neck in a button closure, and two thick straps join the collar to the back of the bodice in an angelic detail. The tulle-trimmed satin lining adds a little fullness to the short skirt, and a scalloped hemline finishes the look of this cute short party dress. Available in junior sizes, this white lace grad party dress is a cute look for an upcoming semi-formal occasion.